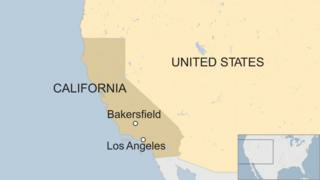 Six people have been killed in linked shootings in the city of Bakersfield in California, police say. The man then drove to another residence where he shot dead two more people. Donny Youngblood of the Kern County Sheriff’s Department said deputies were called to the trucking business after reports of shots being fired at 17:20 local time (00:20 GMT) . After carjacking a vehicle, the woman and child inside managed to escape. The Sheriff’s Department said the shootings took only a short period of time and were not random.